Damn you. Don't start off with a tough one. Tie between The Pit and the Pendulum (1961), The Masque of the Red Death (1964) and The Tomb of Ligeia (1964). Someone, please fuilfill the true potential of Clive Barker's Nightbreed (1990). I don't know about best, but Wes Craven's New Nightmare (1994) was a exceedingly clever subversion of horror tropes and a masterful return to form for Craven. Freddy vs. Jason (2003) killed two franchises. John Carradine had better acting chops, but Lon Chaney, Jr. played the best werewolf ever. Raymond Lemorne, the killer from The Vanishing (1988). Not a horror film: Danger: Diabolik (1968). John Carpenter's Vampires (1998). Nice idea; weak tea. When I was smiling during the chest-bursting scene in Alien. I was 12. The only one I've seen, which I like quite a lot, is Empire of the Ants (1977). Not for me, but yes. Haven't seen it, but A Serbian Film (2010) sounds reprehensible. Ingmar Bergman's The Seventh Seal (1957). Angelique, of course: Lara Parker. 24) If you’re a horror fan, at some point in your past your dad, grandmother, teacher or some other disgusted figure of authority probably wagged her/his finger at you and said, “Why do you insist on reading/watching all this morbid monster/horror junk?” How did you reply? And if that reply fell short somehow, how would you have liked to have replied? 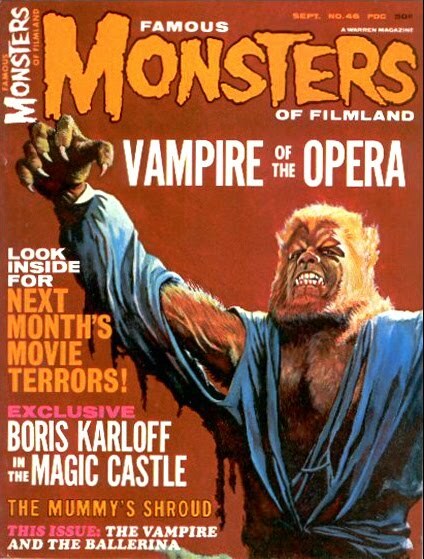 I haven't really enjoyed reading about horror since the days of Forry Ackerman's run on Famous Monsters of Filmland. A masked intruder standing silently, unbeknownst to her, behind Liv Tyler in The Strangers (2008). A recent one, taking my five-year-old to see his first theatrical showing of a horror movie, Frankenstein (1931). 28) What would you say is the most important/significant horror movie of the past 20 years (1992-2012)? Why? Twin Peaks: Fire Walk With Me because it is the pivot point in David Lynch's filmography. Fans (including myself, initially) were disappointed at what a departure it took from its mother TV series. But in retrospect, it reaffirms what was best about the show's fine first season, its tragiccomic sense of horror. And Lynch seems freer and more experimental than ever before, a trend which would continue in his subsequent films. 29) Favorite Dr. Phibes curse (from either film). The Curse of the Werewolf (1961), The Innocents (1961), The Wicker Man (1973), The Brood (1975) and The Strangers (2008). 1) I get to see The Pit and the Pendulum on the big screen next week. Very excited about that! 4) Glenn kenny rates it #2. Given his choice for #1, I think that's fair. But for sheer ability to creep into my head, it might be my #1. 10) Given your choice here, I default to your choice of Famous Monsters covers and your first choice for #30 and submit that Oliver Reed's may be the greatest werewolf of all time-- just maybe not the most iconic. 16) I wonder if anyone will pick Grayson Hall! 17) I love this answer! 28) You've made me want to see this again, and I never thought I would. And yes, I do love your choice of stills! Who could fault the one that accompanies 23)?! Thanks for taking part again, Tony, and for helping to spread the word! Dennis, the only reason Oliver Reed's werewolf isn't my favorite is because of its precious little time onscreen, limited by Hammer's low budget. Hope your kid enjoyed Frankenstein. I was about that age when I saw King Kong (the original), and asked my mom how they were able to get that giant gorilla to climb the Empire State Building. Peter, I don't think THE INNOCENTS is obscure among cinephiles. But ask the average layperson, and I'd give you the opposite answer. Alas, though my son claims he didn't, I think he fell asleep before the Monster showed up. Still, the journey to the theater makes for a great memory. We chose the same actress! Of course, Jaime. Because you and I are right! Some truly great answers, Tony. Excellent call for THE INNOCENTS. I read 'The Turn of the Screw' by Henry James recently and I think the '61 film adaptation did it justice. When I finish my quiz, we may share a few answers. Thanks.